A[mi]dorable Crochet: Every Super Hero Needs A Cape! Every Super Hero Needs A Cape! 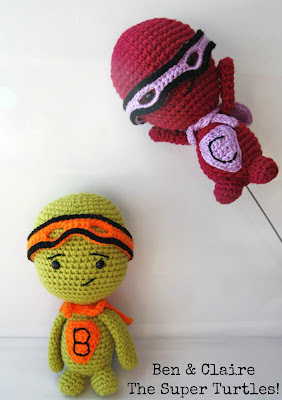 I was comissioned to make a pair of turtles, so I made a pair of super hero turtles and named them after their new owners. Meet Ben and Claire the Super Turtles! And here are some cute hats that I finished up this week! I'm in love with Ben and Claire ^^ So adorable !! are you giving out the pattern for them? I am sorry I didn't write down the pattern for these two. But I do have a small turtle pattern....if you click on the link "Patterns" that is above you can see all my patterns that are available.